A step back in time to explore stories and mysteries of the past. What happens to a glass of Coca-Cola when it is put under a faucet and the water is then turned on? The Coca-Cola then becomes displaced, and while water dilutes it and continues to dilute it, eventually the glass of Coke is no longer there, but only water in its place. Well, that is what happens when people decide that the true history of a person, place or even an object is not enough as it is, that they need to add more and more to it until the real history becomes invisible, or almost untraceable, and the fabricated legends and folklore take on a life of its own, often times becoming accepted as fact. One such example of this is the Ione Hotel. Over the years a lot of misinformation has spread in regards to the hotel’s true history and now it seems almost impossible to find any accurate information about it to date. That will change starting with today. If you look up the history of this hotel online or in recent books, you will find a plethora of information. Unfortunately, most of the information is incorrect. So that was why I decided to dig through the archived newspapers, old history books and records to find the real history behind this hotel so that I could share it once and for all with you! The Ione Hotel has been called the Metropolitan, The Union Hotel, The Haller Hotel, The Golden Star Hotel, and even The Bedbug Inn, but the history of this hotel is much more interesting than even its various names over the years. This blog took a while for me to research, and it is going to be long, but trust me, it will be worth the read. 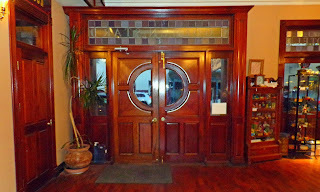 In this article I will go through not only the history of the hotel, backed up with factual information and documentation, but I will also address the local legends and lore. To start off, I have always loved this hotel. I used to roam the halls on summer days when I was staying up at my dad’s on Sutter Lane back in the 1990’s. 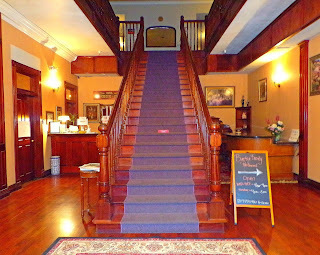 A friend and I would often wander around Ione during the summer, and sometimes for kicks we would ask the owners of the hotel to let us explore the so-called “haunted” hotel. Of course as teenagers, we would scare ourselves, which made it all the more fun! Afterwards we would head over and get a slice of pizza at Loretta’s or over to the diner to get a soft serve cone. This was the time of my teenage years I found interest in Preston Castle and its history as well. It shouldn’t surprise anyone that I would eventually research Ione Hotel’s history, too. To begin with, Ione was not the typical town or city during the Gold Rush. In fact, Ione’s Main Street was not built up until the mid to late 1850’s to begin with. Yes, some people moved there around 1848 and 1849, but it was only a handful of miners and settlers who built their homes. Ione itself did not become a bustling place until at it’s earliest the mid 1850’s. You can verify this by reading The History of Amador County by Jesse D. Mason which is available on Google Play to read for FREE. So for the record, this particular hotel could not have existed in 1849 as some other articles have suggested. The earliest hotels that I found in Ione were the Irena House, owned by Thomas Rickey, and the Ione Valley Hotel. Again, this was during the 1850’s. The Irena house was next door to where the City Hall sits today, and the Ione Valley Hotel’s location is unknown. I could find no records that state where it was located in town at all, but we know it existed and the book The History of Amador County mentions it to have been one of the oldest buildings erected in town. It also mentions that it burned during the Great Fire of Ione on October 8, 1865. Could it have been at the location where the present day Ione Hotel sits? Possibly, but unlikely. Why? Well, the late, great Amador County Historian Larry Cenotto pointed out in a fantastically written article back in 1995 that deed records indicated the original two lots (a small one and a larger one) where the hotel sits today were originally a butcher shop and a saddlery shop. Per Larry Cenotto’s research it wasn’t until later on in the 1870’s, (on the small lot), that the first hotel was erected and named the Metropolitan. It had only five rooms, a saloon and a dining area. The man who operated that hotel was Frederick Haas. 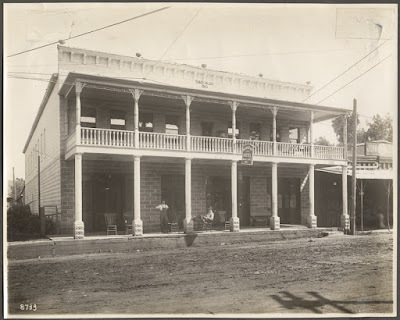 In 1876, there are only two hotels in Ione by this point, one of which was the Veranda Hotel and of course the Metropolitan. By the 1880’s the Glaze brothers owned the property. In 1880, Ione was flooded when the creek overflowed and backed up into Main Street. It was such a bad flood, that 1,300 feet of railroad track was washed away. No doubt all the businesses on Main Street suffered some serious water damage from this flood. After a fire at the Veranda Hotel (just down the street) on January 26, 1884, the Eaton family who had been running the Veranda Hotel, went over to work for the Glaze brothers. The Metropolitan Hotel was then renamed the Union Hotel. The Daily Alta California dated January 27, 1884 mentions the fire at the Veranda Hotel. It also notes that a gentleman named Thomas Bennett lost his life in the fire. 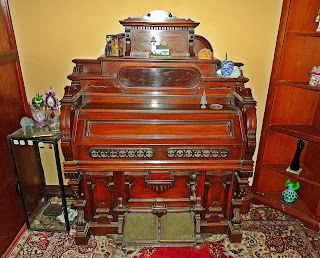 This is important to remember as we go further into this blog, because this is the ONLY hotel fire in Ione during that time period in which a death occurred. It is noted in the Volcano Weekly Ledger that the Veranda House was built on the lot next door to where the Irena House once stood, which indicates or insinuates the latter was destroyed. I found an ad for the Veranda Hotel in the Volcano Weekly Ledger dating back to 1857. 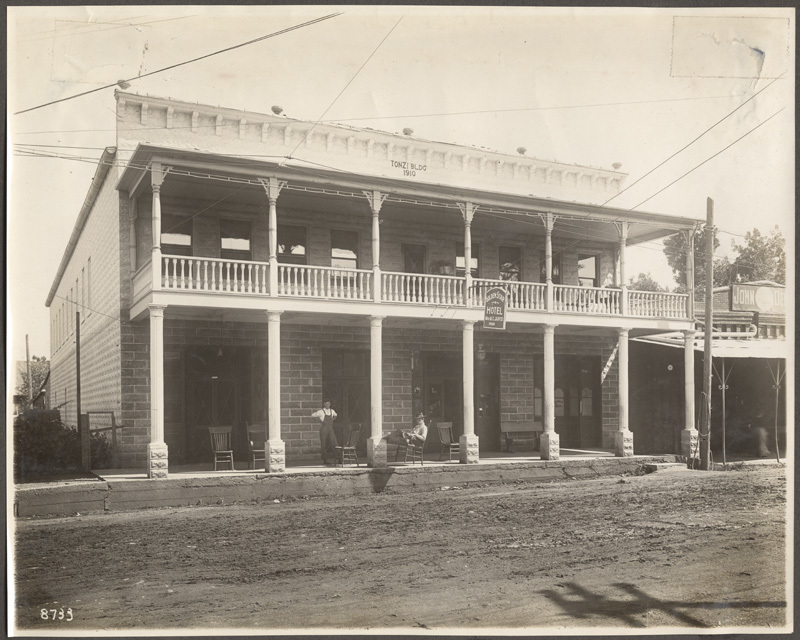 When the Veranda burned down in 1884, Mr. McCauley eventually purchased the land from Mrs. Kingsley and built his Commercial Hotel there. Of course later on it became the spot where City Hall is now situated. The March 24, 1893 edition of the Amador Ledger tells of the creek once again backing up, which overflowed into businesses. The water caused damage to the lower level of the Union Hotel again, along with their stage barn. At this time period, the hotel had a stage stop there for passengers to rest in between stages and to obtain transportation to the railroad. By 1900, Joseph and Rosa Tonzi, natives of Switzerland, purchased the Union Hotel. Sadly though, the hotel didn’t last very long. “Disastrous Fire in Ione – About 12 o’clock last Monday night the denizens of our sister town were aroused by the dread alarm of fire. The fire started in the Union Hotel’s bakery in the rear of the Union Hotel. It was soon fanned by the breeze into a devastating blaze. The Union Hotel and Robert Mayes’ saloon were soon in a blaze and for other food the fire fiend hit upon the old stage stables, devouring that also. Hopper’s General merchandise store, a fireproof building, sustained a loss of $1,000. The loss to the hotel and saloon is estimated at $9,000, besides private losses to inmates, and the insurance amounts to $3200, $600 of which is on the saloon. The inmates of the hotel succeeded in escaping, though none of them were able to save anything beyond what they wore, and that was very little in most cases. No one was seriously injured, but several narrow escapes were reported. This is the most disastrous conflagration Ione has had in some years.”--- Amador Ledger, January 19, 1900. After this fire, the Tonzi family chose to erect another hotel in its place, but their first one was poorly made and only lasted nine years before burning up in another fire in 1909. “Soon after the fire broke out Superintendent Randall of the Preston School, dispatched a number of his boys who have been drilled in the method of fighting fires, and they mounted to the roofs and handled the hose and fire axes in true fireman fashion, aiding very materially in saving George Woolsey’s building, and thereby the whole north side of Main Street, and they are deserving a great deal of credit. The hotel was a flimsy constructed two-story frame building, owned by Mrs. Tonzi of Mt. Echo, and J.M. Haller the lessee. The building was insured in the Orient Insurance Company, J.W. Surface agent, for $1,000 which will go a long way toward covering the loss. Mr. Haller, the lessee, estimates his loss at $1,600 with $450 of insurance. Mr. Haller’s loss is nearly total, as much of the stuff moved out of the hotel was either destroyed or so badly damaged as to be worthless. The loss to Sibole & Gillum was by water and smoke and is fully covered by insurance, as is, also the damage to the building. Hammer’s store, a flimsy frame structure a few feet west of the hotel, was saved only by the greatest exertion, and that, in large part, by some of our women, who formed a bucket brigade and kept the premises thoroughly wet, at the expense of disheveled hair and bedraggled wearing apparel. Prominent among them was noticed Ida Williams, Mrs. Maddux, Mrs. Nichols, Mrs. Hammer, Mrs. Cotto, Mrs. Fissier, Mrs. Browning, Alice Greenhaigh, and Ethel Mack and there might have been others. At this point the Tonzi family was through with wooden structures, so they bought the larger lot next door and decided to expand and erect a much larger, beautiful stone hotel instead and renamed it the Golden Star Hotel. The Tonzi's would have different people run the hotel for them, such as Mrs. M.C. Jarvis, or E.F. Mueller, but the hotel always belonged to the Tonzi family. The property remained in the Tonzi family up until Dorothy Stacey purchased the hotel in 1971. It was during Dorothy’s ownership that she briefly named the hotel the Bedbug Inn. 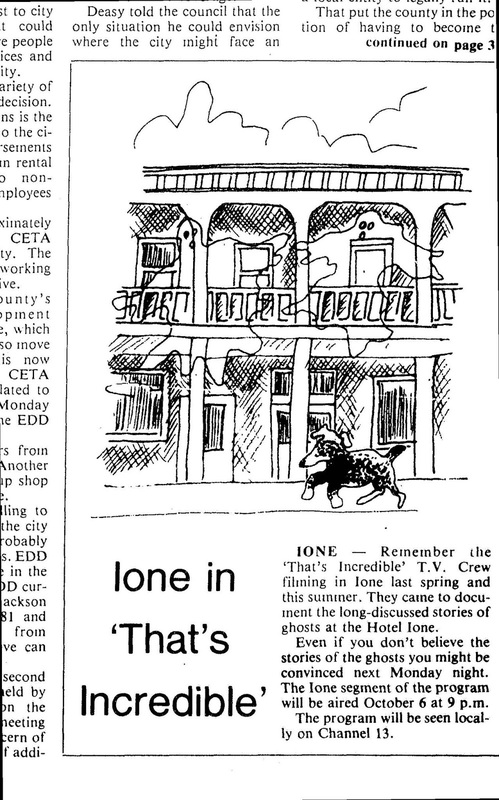 It didn’t stay that way for long and it eventually became the Ione Hotel (or Hotel Ione). In April of 1977, Bill and Milly Jones, of Walnut Creek purchased the hotel and dove headfirst into the hospitality industry. I was able to speak to Milly Jones over the phone and ask her some questions about what she remembered when she owned the hotel with her husband, as well as clearing up some misinformation about some of the legends and lore at the hotel. At 90 years old, she is still very much a lively, kind and quick-witted gal and it was such a pleasure to speak with her. According to Milly’s book "The Hotel Ione," and other various news clippings of the time, the hotel catered to the working man. Most of their residents worked all week in labor jobs and went home to their families on the weekends. Many of the men who worked on Rancho Seco, stayed at their hotel during the week as well. 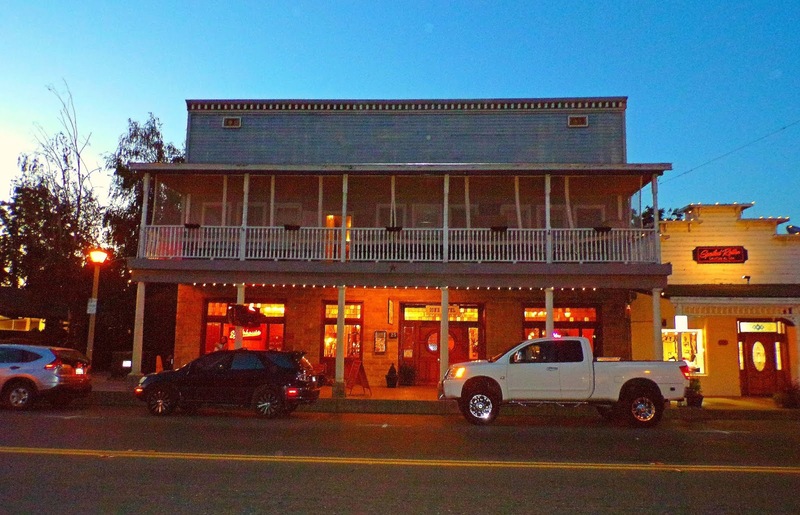 It was around the time that Milly and Bill bought the hotel that the rumors of the hotel being haunted started to make their rounds about Amador County. My parents lived on Marlette in town, and my mother remembers when the ghost stories started to pick up steam in the late 1970s. A funny tidbit to add to this story is that while I spoke to Milly on the phone, I learned that it was my father (who owned a carpet store in Jackson) who laid the carpet at their hotel in the late 1970s. So I guess in a way I have some family history at this hotel, too! It was while Milly and her husband were running the hotel that they discovered the covered well in the middle of the building. According to Milly, her husband was the first to inspect it, and discovered a very well-made stone well going all the way down. There is also a drain at the bottom that goes to the creek. Bill noticed something was stuck at the bottom, so they called the Fire Department to come out. With the use of a grappling hook they were able to pull out an old antique hobby horse which more than likely dated back to the late 1800’s or early 1900’s. Milly claimed in the Amador Progress News (Ione Valley Echo) dated back in June 25, 1980 that shortly after opening the well, supernatural events started occurring. Because the well was at the ground level, Bill decided to add stones to build a traditional well from the ground level up equipped with a hanging bucket, wheel and rope. At that point the layout of the hotel was very much different than it is today. The big staircase going up to the second level was set further back inside the hotel and the well was situated just to the left of the stairs. If you visit the hotel today, you will notice the well is set back in the dining room, and the new staircase is way up front near the front door of the lobby. So unless you know how the hotel was back then, it might be hard for you to wrap your head around the old layout. 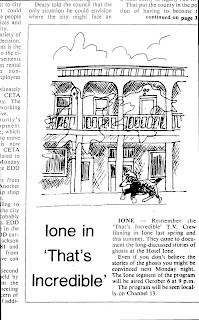 During the 1980’s “Ripley’s Believe it or Not!” came to film segments about the ghost stories swirling around town about the hotel, as well as local news crews. Even the television show “That’s Incredible!” hosted by Ted Bateman came to town to film for several days. 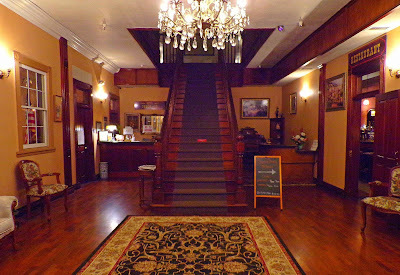 It really wasn’t until the Jones’ came to the hotel that the property got so much exposure for its alleged hauntings, and the ghost stories have continued to spread since then as well. After Bill suffered from a severe back injury in 1984, Milly hired a friend of theirs, Morgan to run the hotel and saloon for them. By July 1, 1984 they sold the hotel to Loretta Tillery. While Loretta Tillery owned the hotel, another news crew with television journalist Jonathan Mumm came to film a short segment about the hotel being haunted. You can watch the video here from Youtube. As you can see the layout of the upstairs was also different, which means the room numbers were in different places as well. This is also an important thing to remember as we get further into the blog with the legends and lore. In 1988, while Loretta Tillery and three other co-owners: Jay McCarthy, Jerry Cassesi and Bonnie Aparicio were in the middle of completely renovating the hotel, and were just about to sell the property to new owners the last week of June, the hotel caught fire. The stone hotel built painstakingly by the Tonzi family in 1910, that stood for nearly 78 years was completely gutted on Father’s Day, June 19, 1988. According to my interview with Milly, it was on Father’s Day, one of the families living in the hotel at the time decided to go across the street to get hot chocolate but they left their young child alone in the room along with a baby sleeping in a crib. Milly's recollection was that the young child had found a cigarette lighter and was playing with it. When the parents looked up at the hotel window they saw the curtains on fire. They rushed in and got their children, but the fire gutted the entire hotel. The newspapers claimed that a young child was playing with matches when the fire started. 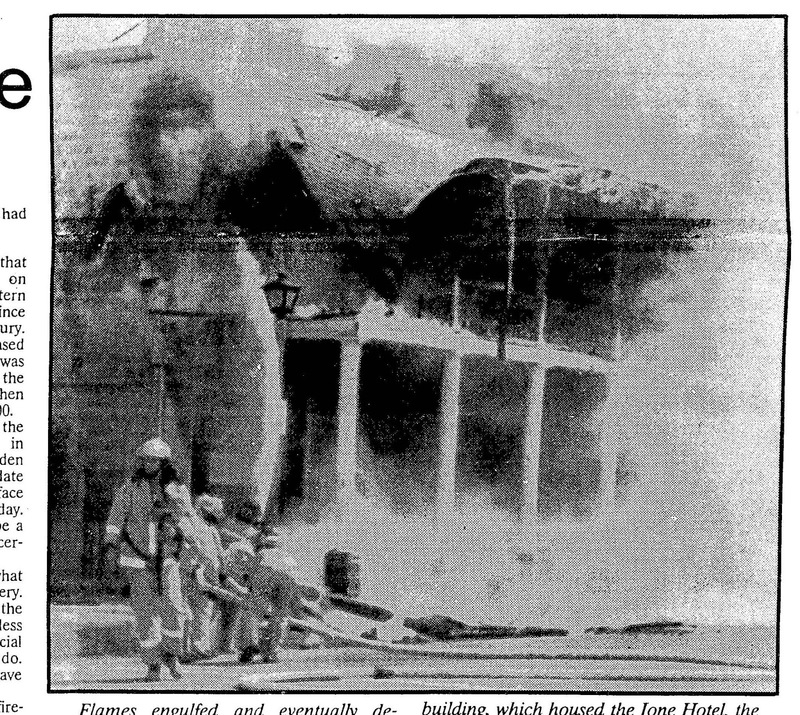 According to the Amador Dispatch dated June 22, 1988, it states the fire took place on Sunday at around 10 a.m. Not only did the hotel burn but also the offices of Ione Realty and the newly opened restaurant the Pasta House which had just celebrated their grand opening two nights earlier. Fire that gutted the Ione Hotel 1988. According to Carole Perry at Century 21, the owners were in the process of selling the hotel for $350,000 to excited buyers. Once learning about the fire, the buyers were truly devastated. The fire reached temperatures of up to 3000 degrees and crews from all over the county and other nearby areas came to help in the rescue effort, to no avail. Even some of the boys at Preston and volunteer firefighters from Mule Creek State Prison joined in the effort. Out of 60 firefighters who fought the blaze, only two were injured. According to records, the struggle to extinguish the fire had to do with a lack of water available. A distribution valve was not operating properly thus not allowing the right volume of water to be accessible to the fire crews. In all, 23 people who were living at the hotel were homeless (12 of which were children). After it was all said and done, the owners of the hotel expressed their deepest gratitude to everyone who helped fight the fire and published their letter in the Amador Dispatch on June 24, 1988. The hotel sat for years empty, lifeless and gutted. Then in the mid 1990’s new owners Dorothy and Tom Shone purchased the property and put all their blood, sweat and tears into completely reestablishing the Ione Hotel, and bringing it back to life again. In later years, the hotel was sold again to Mahmood Ghani, and now it is ran by the new proprietors Steve and Cindy Burke. The Burke family has definitely done a fantastic job with bringing the Ione Hotel back to its original grandeur. It is so lovely that I am sure even the Tonzi family would be proud! It was a pleasure visiting the hotel recently and speaking to Cindy. She was very gracious and allowed me access to the upstairs to roam around and even let me peek down the well in the middle of her restaurant, while she entertained her patrons eating dinner! The hotel looks even more beautiful than I remembered from the 1990’s when I last visited. 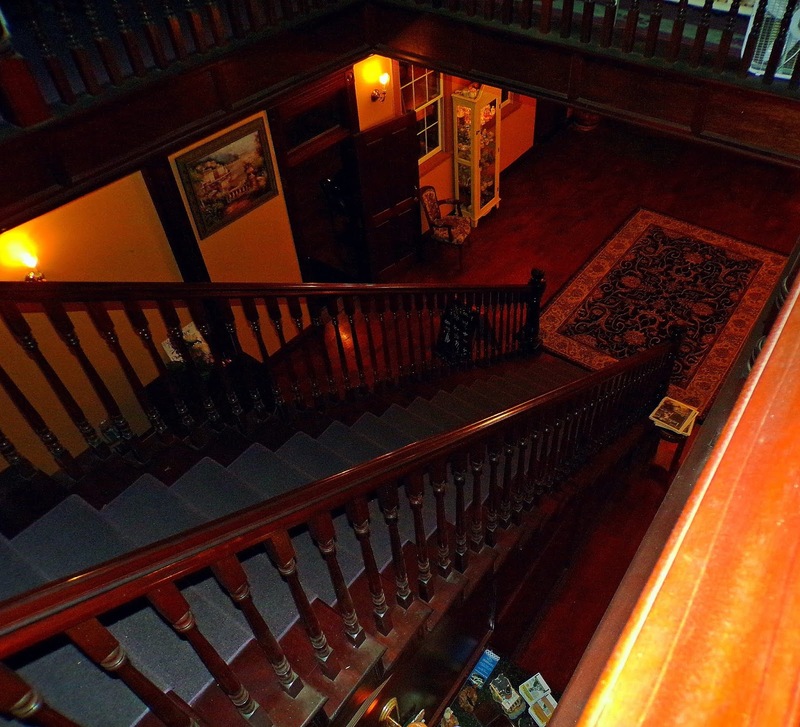 The dark mahogany wood throughout the entire building is something dreamy, like a step back in time to another era. All in all, I would say that the hotel is in great hands, and I can see that the Burke’s truly love the hotel and it shows. It is apparent that they are doing a fine job carrying on in the footsteps of their predecessors before them, including the founders of the stone hotel, the Tonzi family. So now to the part some of you have been waiting for….the “other side” of the Ione Hotel. In the recent years there have been a lot of paranormal investigators and websites that mention the hotel's haunted history and well, let's just say, much of it isn't paranormal at all. Well, let’s go down the line and address some of the urban legends and lore (or ghost stories) of the hotel and then I will either confirm or debunk them for you. Ready? Let’s go! Said to have been a prostitute in the late 1800’s that committed suicide in her room. Stories include that there is a mark in one of the rooms that will not wash away or if painted it comes back. I could not find one single account in any of the old newspapers of the area mentioning any sort of incident at the hotel involving a prostitute who committed suicide, so it looks like this is just another fabricated story. According to the new owners, Cindy Burke, she knows nothing of this story. 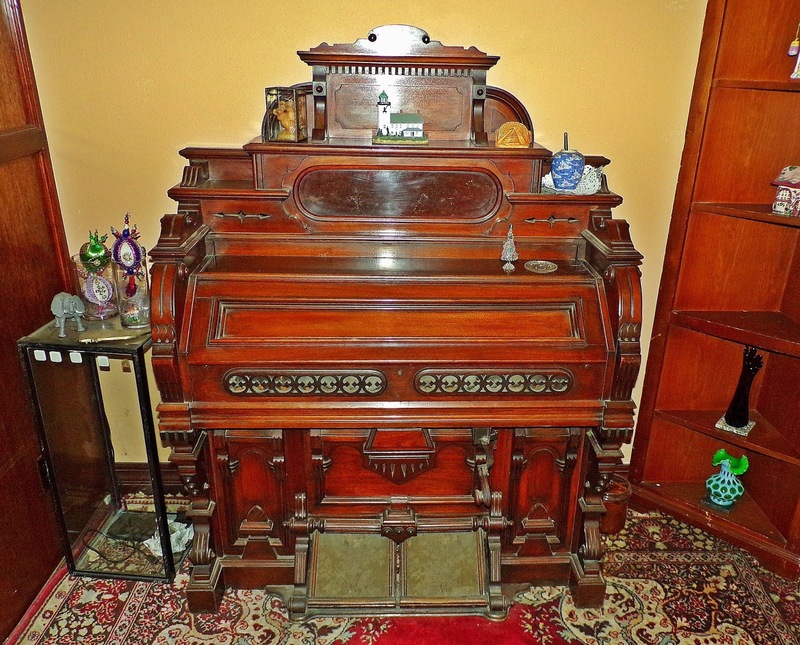 Even former owner, Milly Jones stated the only thing she had heard was that the door to George Williams’ room (which was at that time #4) had a dark knot in the wood grain that some people had mentioned, but it was not anything supernatural. For the record, there were NO prostitutes who killed themselves in the hotel at any time, so this legend is debunked! This story is tricky, and the reason I say this is because I am not one to dismiss someone’s personal experiences. If Milly Jones claims that she had an encounter with an entity and the name Mary Phelps came up, I am not going to say she didn’t. As the story went, (and you can read it in Milly’s Book on Amazon) the entity identified herself as Mary Phelps and that her grandson died in a fire there. Again, she claims a family member of the person came and confirmed it. However, there were no fires in this hotel that took the lives of anyone at any time. So again, I will not dismiss this experience, but I can say that no one died in a fire at this hotel at any time and you can feel free to search the Amador County Library’s newspaper archives too, for your own verification of this. Now, George Williams is a chap that did exist, and he did die at the hotel. This is actually a true story. 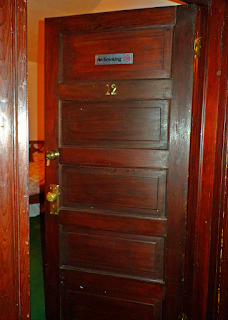 George lived in room # 4, which is not the same as the # 4 at the hotel today. Remember after the fire in 1988, the layout was changed dramatically when it was rebuilt on the inside. So walls are in places they weren’t before, and rooms have been renumbered. Remember earlier I mentioned that the staircase was set further back before? 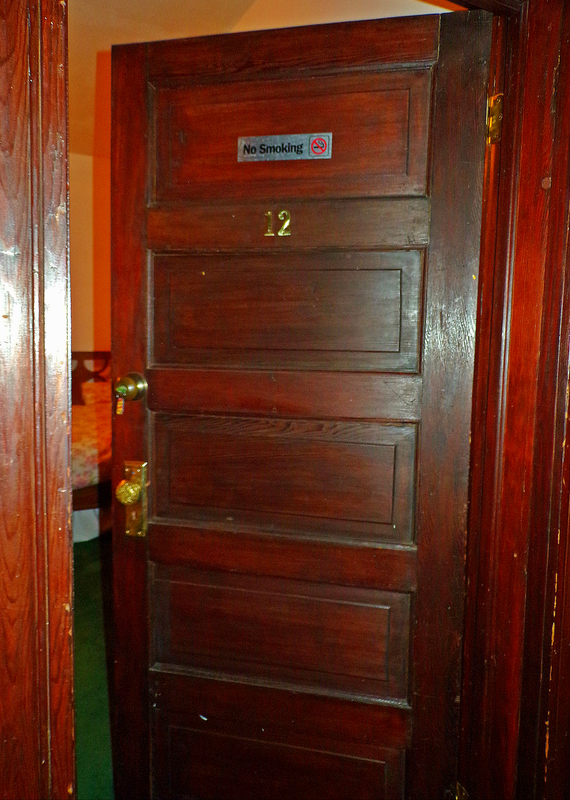 Well, according to my calculations where George’s room was (#4) I believe it is where or close to where Room # 12 sits now. Again, give or take a few feet. It is definitely on that side of the hotel though. According to Milly, there were plenty of people back in the 1970’s who remembered George well, and confirmed he died of a heart attack in his room at the hotel. Bill Ketchum was quoted in the newspaper back in 1980 talking about this very thing. Also, Milly told me that one of her neighbors, an elderly lady, admitted that both she and another lady had helped George get up to his room on the night that he died. He was very drunk, so they guided him up the stairs, and plopped him down on his bed. They even went so far as to take his shoes off and cover him up with a blanket before shutting the door behind him. Although he died of a heart attack it sounds to me like he passed in his sleep, and since he was so drunk, let’s hope he didn’t feel a thing! George is buried at the old Catholic Cemetery in town. Okay, so now we are onto the well. So there has been some misinformation about the origins of the well, so I wanted to clear this up with you first. 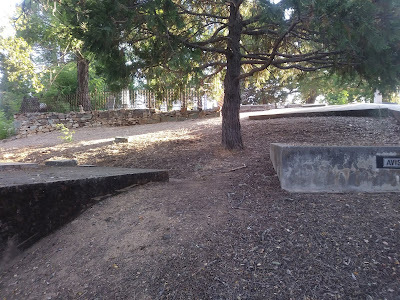 I have heard from several people that the story going around for years was that this was an ancient Miwok Indian well, and that because of this the well could not be touched and the hotel had to be built around it. That is completely false! This well does NOT date back to the Miwok Indians. I am not sure who started this rumor years ago, but they obviously didn’t look into the customs and living traditions of Native Americans. The Miwok (coastal and inland) were not known for digging wells. Also, the well is only 50-100 yards from the creek. The creeks, rivers and streams were the water source they would use to begin with. Some tribes of Native Americans in the plains and especially desert areas like Arizona are known for digging aqueducts or trenches but not the type of well that we are talking about here. So for the record, this well, was hand built with stone all the way to the bottom, and even Milly Jones recalled her husband noticing the stonework all the way down when he first opened the cover of the well back in the late 1970's. She also mentioned to me that it has a drain at the bottom which flows out to the creek. 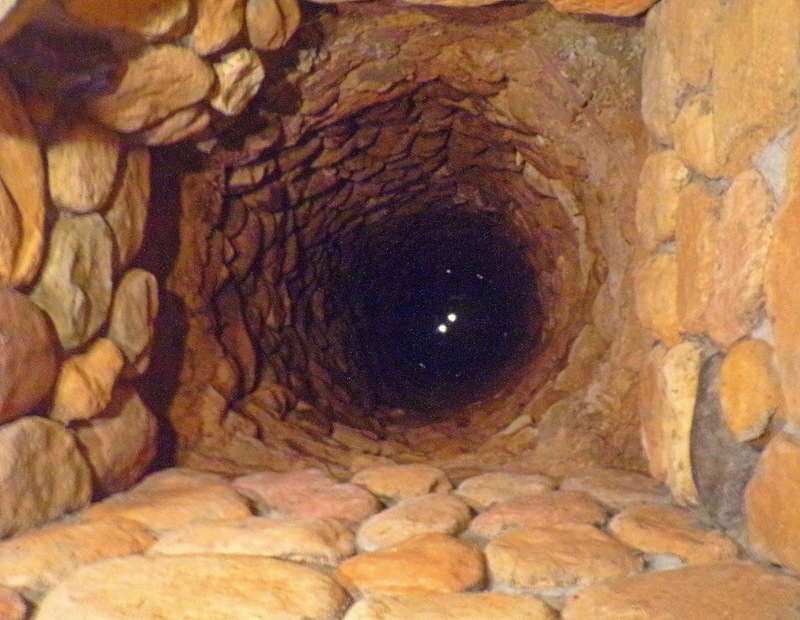 This was a very well constructed well-water system for that time period and it mimics the wells found in Europe. So now we know this was a “caucasian” hand-built well, probably constructed around the time the saddlery shop and barber shop were situated on those lots in mid 1800's. According to Milly, there were three original wells in Ione and one of the other wells is located in the basement of a business just across the street. Another thing to mention is that I scoured through the archives of the newspapers in Amador County and found no trace of evidence that anyone fell down this well, or died in it at any point in time. (A lot of people try to insinuate a child fell in and died). According to Milly’s book there was a strange odor that would appear in the lobby on Saturday mornings and would last about 15 minutes and then dissipate. Later on, it was quoted in an online article that later owner Mahmood Ghani complained of the same thing, and the article went so far as to claim he hired someone to perform an exorcism to rid the hotel of the stink, as funny as that sounds! Well, the new proprietors have had no such issues whatsoever and Cindy told me when she moved in, the grease traps looked like they hadn’t been cleaned in years. The hotel was in such a poor state, they had a lot of cleaning and restoring to do, and have never had any issue with any phantom smells. After speaking to Milly, I think I figured out the cause of the phantom smell that plagued the hotel at certain times. Well, back in the 1970’s the plumbing and the drainage systems in Ione weren’t always the best, plus on a Saturday, the busiest day of the week, there was a lot of showers running and toilets being flushed all at once, which Milly and I believe that could have caused a back-up in the sewer or drainage system and if the vents weren’t working right, a smell could have temporarily backed up into the hotel for a few minutes. That is the most likely scenario. In all my research I have not found any credible stories relating to room #13, only recent online articles mentioning it. I will say though it is in the same general area near where room #4 originally was (although I still think room #12 is more closely situated to the original room #4). You must remember the layout of the hotel was much different back then, so the rooms are not in the exact spot they once were, and it is even possible that half of room #12 and half of room #13 are in the same spot where the original room #4 was due to the change of the construction plans and layout when new walls and doorways were put up after the fire in 1988. According to Jonathan Mumm, the same news reporter in the Youtube video above, he stated that Tom Shone had told him that he renumbered room # 4 to room # 13 after they remodeled the hotel in 1995. He claimed that he changed the room to # 13 to be spookier. Again, George's room was originally very narrow (and you can see it by the Youtube video above), and some of the rooms you find there today seem a bit wider now, because of the construction and rebuild after the fire of 1988. If you would like to read more about the alleged hauntings at the hotel, you will have to read Milly Jones’ book "The Hotel Ione" on Amazon, as I don’t delve too deep into the paranormal, I prefer to dig for the factual history of a location and share that instead. Thank you Larry, I couldn’t agree more. Benjamin Franklin was once quoted saying, “Show me your cemeteries and I will tell you what kind of people you have.” His words ring true even to this day, as we can see just what type of people live amongst us by the way our historic cemeteries are treated. In one such case in particular, it is apparent that the very people elected to represent the city of Ventura have been hiding a very dirty little secret about their predecessors' actions for far too long, and this upcoming documentary by film maker and historian, Brandon Alvis sets to expose these dark secrets that have been lurking just below the surface once and for all. The county seat of Ventura County, known as San Buenaventura (or Ventura) has been covering up one of the most despicable cases of cemetery desecration that I have seen since researching the horrid activities that took place during the transition of moving the cemeteries out of San Francisco to the nearby "city of the dead," Colma. 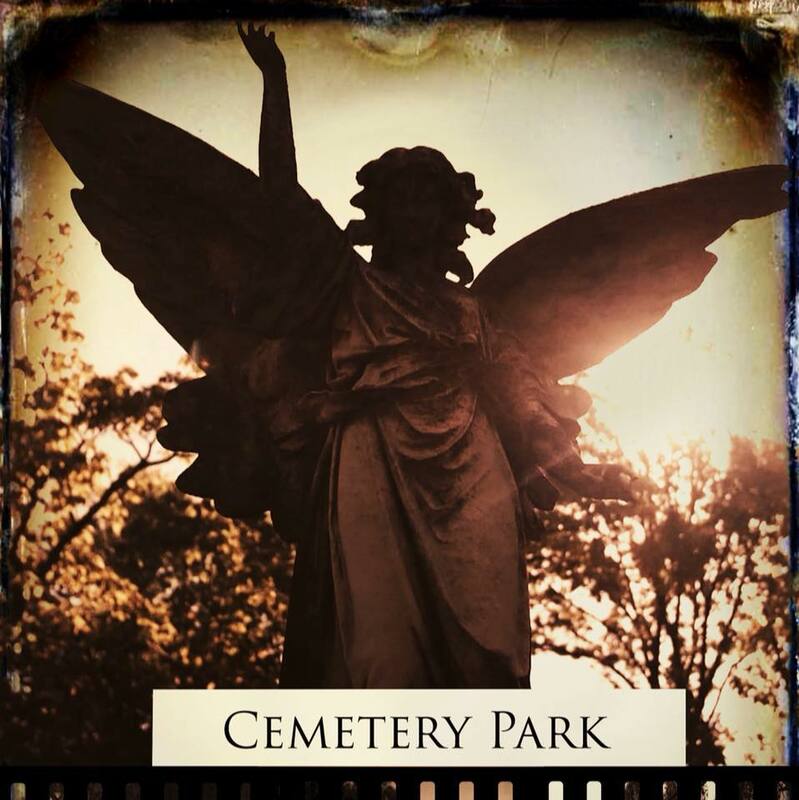 In this meticulously researched and well-presented documentary known as “Cemetery Park,” Mr. Alvis displays the truth about the heinous destruction of the pioneer cemetery that took place back in the 1960’s, as well as the steps the city took to sweep their actions under the rug for over the past five decades. With a plethora of information, interviews, photographs and filmed footage of various city council meetings, the viewer gets to see for themselves the true facts surrounding the case, with no stone un-turned and no sugar-coating whatsoever. At times I found myself in tears because of the sadness I felt for those pioneers who had spent their lives building up the community around them, only to see their graves destroyed and their final resting place be desecrated by the newer generation of elected officials in order to make way for a dog park. I was fortunate to get to see a pre-screening of this fantastic documentary, and I cannot say enough good things about it. With its beautiful formatting, visual effects, and musical score, the film pulls you into the story and as heart-breaking as the subject matter is, it keeps you enthralled to the very end. I look forward to many more films from Mr. Alvis, as he is truly a talented and gifted film maker. It is apparent that he really puts his blood, sweat and tears into each one of his projects, which leads to perfection each and every time. 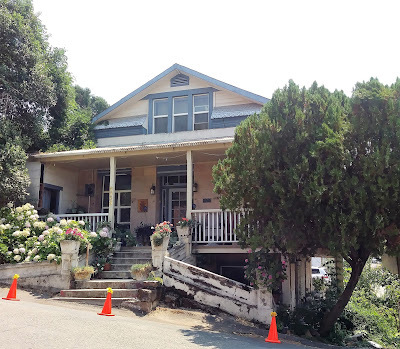 This is my second blog featuring Mokelumne Hill's history. My first blog on this subject matter was focused on the history of the Hotel Leger, including the possible origins to its ghost stories. I also took the time to debunk some common myths that had been spread as "fact" for too long regarding that hotel. 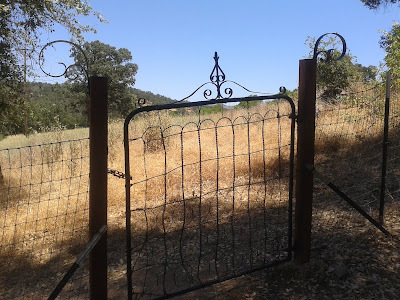 Needless to say, I love Mokelumne Hill, and I want to share with you the little hidden treasures in it's history. 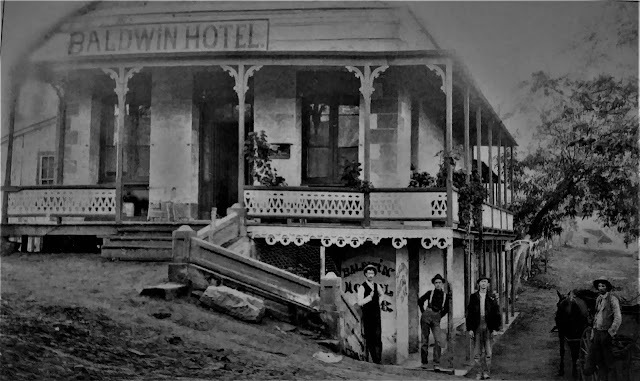 So today, my next topic will be on the history of the Baldwin Hotel. The structure located at 8353 W. Center Street (corner of Center and Clark) was first built back in 1854, by John Rapetto and his partner John Rogers. Since then it has housed several businesses including Raggio's Stone House up until around 1876, the Baldwin Hotel originally operated by Louis Baldwin, and the Gardella Mortuary, which was located in the basement of the building. When Charles Gardella purchased the property, taking over the Baldwin Hotel, he used his skills as a carpenter to make several additions to the structure, including the veranda and the gable-end gingerbread woodwork which was very popular in Victorian design at the time. Charles Gardella immigrated from Italy to the United States in 1861. He eventually settled in Mokelumne Hill, and Calaveras County Marriage Records note that he married Lenora Catalde on November 11, 1875. The 1880 Census has him living in Moke Hill, and working as a wagon maker. By the 1900 Census, he is listed as a Carpenter, with his wife and eight children (half of whom were adults) living with him. 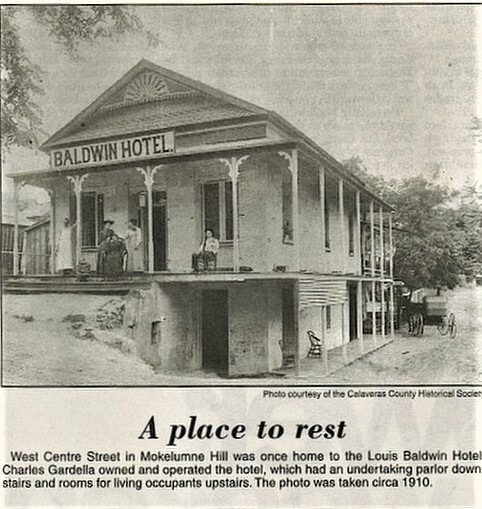 It was on March 25, 1903 when a strange incident occurred at the Baldwin Hotel. The original headlines in the newspapers were: "Kills Himself While Intoxicated," and "Went Outside And Shot Himself." Later on this was reported in the local papers as a form of redaction for their earlier posts. The Coroner's jury finds a verdict accidental death on testimony of principal witnesses. At the time of writing the account of the death of James. W. Porteus, last week, who shot himself at Mokelumne Hill on the morning of the 25th, we gave the commonly accepted report that it was a case of suicide. The testimony brought out at the inquest, however, seemed to give another aspect to the affair & the jury returned the verdict of accidental death. Given the fact that Porteous was very intoxicated when he stepped out of his room with the intent to shoot something, it is very likely he did shoot himself on accident, fatally injuring himself. Accident or suicide, the death was odd either way. I could find no other reports of deaths in this building, although it is very possible given the age of the structure and the amount of people who have owned or lived in it over the years, that there have been others who have passed on while inside. It doesn't necessarily mean those deaths were suspicious though, just that since people do grow old and die, or get sick and die, it is logical to conclude that James Porteous' death was more than likely not the first or the last one to occur on the property. In 1909, Charles Gardella's wife, Lenora divorced Gardella and took the younger children with her. She remarried, but their older sons stayed near their father. John Gardella (1888-1956), Charles' son, eventually opened the Gardella Mortuary in the downstairs portion of the house in the basement. He was the County Coroner and a mortician for over 48 years. You can find James Porteous's grave at the Mokelumne Hill Cemetery just down the road from where he tragically ended his own life (accident or not). You can also find Charles Gardella and John Gardella's graves at the Mokelumne Hill Cemetery as well. (Please remember this house is a PRIVATE RESIDENCE now, so please do not disturb the current owners/residents). Well, I hope you enjoyed this short but concise history of the Baldwin Hotel. By now we have reached the 1860's. Between 1860 and 1880, Fanny basically flew under the radar. Other than the slanderous newspaper articles written about her in 1862, and her novel of a response to those newspaper articles, there really isn't much in the way of documentation showing what she was up to during that time period. 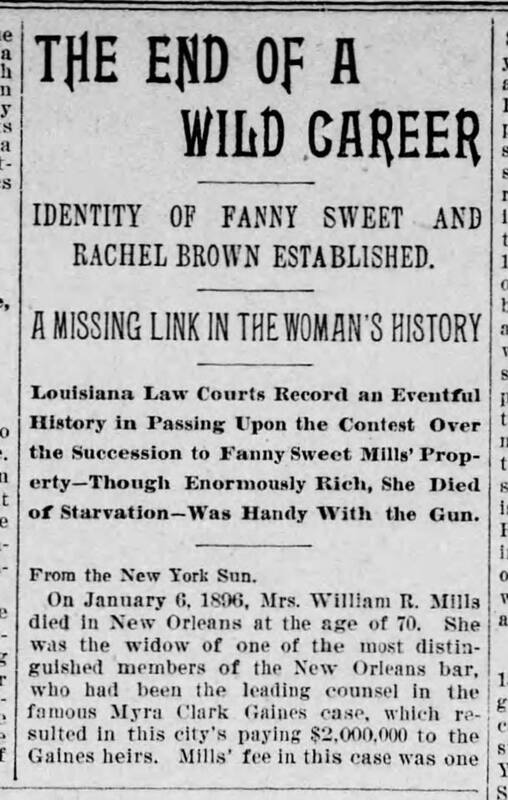 By 1880, fifty-four year old Fanny (who listed herself as being forty-five) pops up in the census in New Orleans, but now she is working as a domestic for William R. Mills. The census recorder misspelled her name was Fannie Seyman, thus the reason it was hard to locate. At some point during her employment to Mr. Mills, Fanny must have won his heart, or he won hers. Either way, the two were married and it appears the pair were actually happy with the union. Mills was a prominent attorney in New Orleans and his last client, Myra Clark Gaines retained him to represent her in her infamous lawsuit (originally known as the longest running lawsuit in the history of the United States) which proved to be the biggest payoff in Mill's life. 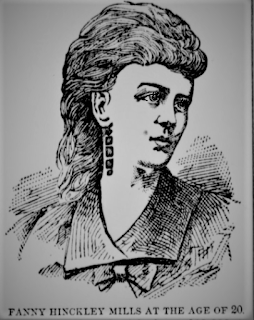 Sadly, he never got a chance to truly enjoy the wealth he received from that one case, and so on July 17, 1891, William R. Mills passed away, leaving all his fortune to his "beloved wife." Between 1891 and 1893, Fanny continued to live in excess but developed permanent blindness by 1893, and her paranoia became even more severe. By this time she was worried that everyone wanted money from her, and that if she had anyone living with her that they would rob her. Because of this fear of everyone possibly wanting to rob her, she became a hermit in her own home, refusing to allow outsiders to come inside to help her. She would occasionally send for a doctor, an attorney or notary, especially when it came to her wills. Prior to her death she had written up several wills but revoked them all just before her death. The last will was to leave many friends and attorneys her estate, as well as a large portion going to an orphanage (which I believe might have been where William G. Stephen's children might have ended up at). Another interesting tidbit of her revoked will was a clause for anyone she had listed to inherit money from her. Her demand was that they must all attend her funeral and visit her grave regularly, also visiting every All Saint's Day or their inheritance would be stopped and the money given to St. Joseph's Church instead. With all the money she had at her disposal: $45,000 of US Government Bonds, over $60,000 in real estate, and much more including a $450 check found under her pillow, Fanny refused to have anyone help her or purchase food for her. Towards the end she fell ill and being all alone and too weak to send for help, she fell to the floor of her room and remained there, virtually starving to death. Eventually a neighbor of hers worried about her and decided to go inside the house, where she discovered her emaciated body, rotting away. It was a very sad end for Fanny....but, was it really the end? Well, as far as her life was concerned, yes, she was dead, but her story was far from over. Fanny Mills or Rachel Brown? Given the highly publicized account of her sudden death and her past 'infamy' with the newspapers years prior, the media had a field day with Fanny's story once again rehashing the past, all without her able to defend herself this time. Since Fanny had passed away and her wills had been previously revoked, she died intestate. This gave the State of Louisiana the green light to try to lay claim on her property, but they didn't expect people to come out of the woodwork claiming to be heirs of hers. 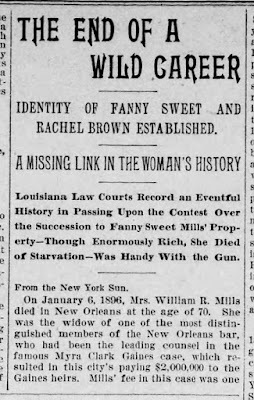 There were people from all over the country trying to claim they were related to Fanny, but it was Charles Clinton Brown and niece Rosanna McVey Fuller who helped solve the biggest mystery of all: Who was Fanny Mills (Fanny Sweet, Fanny Hinkley, Fanny Smith, etc)? It took two years of litigation to sort this mess out. From witness statements, investigating long lost letters and documents and even cross-examining witnesses who committed perjury in court, this case certainly gained attention from the press. During one part of the court battle, J.F. Moliere and J.A. Peale testified, claiming they met Fanny on her crossing over from England to the US on the ship Waterloo, trying to contradict the story that C.C. Brown had given to court. When the ship's passenger list was obtained, neither Fanny nor Moliere or Peale were listed on it. Needless to say their testimony was thrown out. Over the years Fanny's story has been slandered terribly. Yes, she lied about her background from the very beginning, but you have to ask yourself, why? Was she lying to hide her past because of embarrassment? Did she wish to forget her reality and instead chose to create this fantasy in which she was the star? Regardless of why she started to lie about her past and strove so hard to conceal her true identity, many of the rumors or flat out accusations made against her were simply unfounded. Again, just because she lied about some things doesn't mean everything she said was a lie. And if people wish to believe all the horrible things spread about her, why do they choose to forget the good that was documented about her? What about the thousands of dollars that was said to have been donated by Fanny during the Civil War to help the injured and sick on the battlefields? What about the monies she gave to people in New Orleans who reached out to her in times of crisis, needing some financial help. She was adamant that she never turned a person away no matter what. For the record, we will never know in exact detail all the truths about Fanny's life. We have what the newspapers liked to sensationalize about her and then what she wrote about herself. As I wrote in the first part of this story, "there are always two sides to every story," and I feel we owe it to Fanny to at least give her that platform here to share her side of the story and allow us to come to our own conclusions after reading it. Rachel Brown, aka Fanny Hinkley-Mills was laid to rest at the St. Louis Cemetery # 3 in New Orleans in January of 1896, at the age of 70. 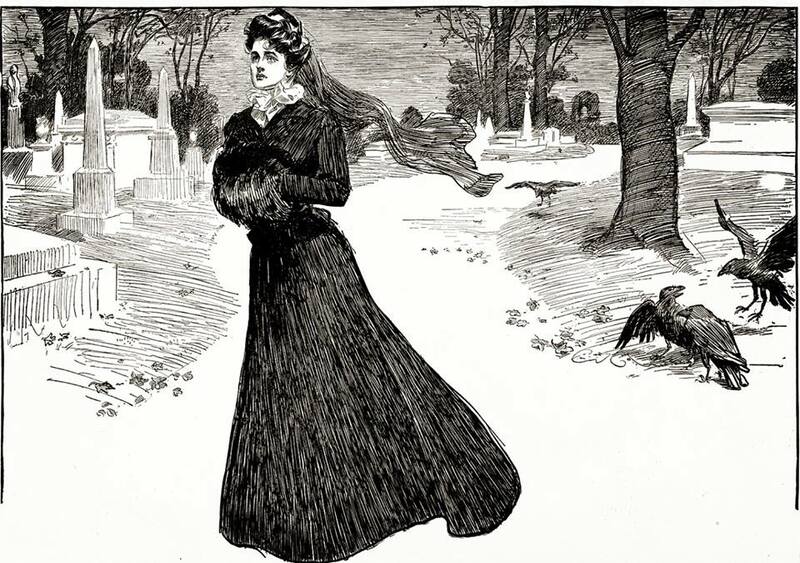 Whether you believe Fanny's personal account or the elaborate and scandalous rumors spread about her by the newspapers of the time, Fanny deserves our respect in death that was not afforded to her in life. In ending, I felt the best words would be Fanny's own words from the ending of her auto-biographical response to the slanderous accusations made against her back in 1862. I felt her own words were not only fitting but also give us a chance to let Fanny finally speak once and for all on her own behalf. "And now she has nothing to add to this already lengthy card, unless that it is from no desire to obtain further notoriety, that she has published it. But falsehoods had been circulated of such skillful framing and circumstantial account, that she was forced, in justice to herself, to expose them in all the nakedness of their monstrosity. Having done so in a manner, as she believes, to satisfy the most prejudiced critic, she prays from the public only peace and quiet, and freedom from molestation. For the wrong that has been done to her, either from malice or thoughtfulness, she forgives, if she cannot forget; and she will pray that those who wronged her may be forgiven by a power on high for all the anguish they have unjustly caused her, as well as for the shame they have heaped upon the dead, who cannot answer them, and upon the little orphans who may yet, in after years, be doomed to a bitter knowledge of all that was spoken concerning their parent. Louisiana Reports: Cases Argued and Determined, Supreme Court of Louisiana. Volume 52, 1900. U.S. Supreme Court, Louisiana, No. 13,206 – November 20, 1899 (Hon. Fred D. King, presiding). & various other records, including census records. I stumbled upon this story several years ago but didn't take the time to write about it until recently. Although the tragedy itself took place back in 1918, just outside of Jackson, California, the real story started eleven years earlier. 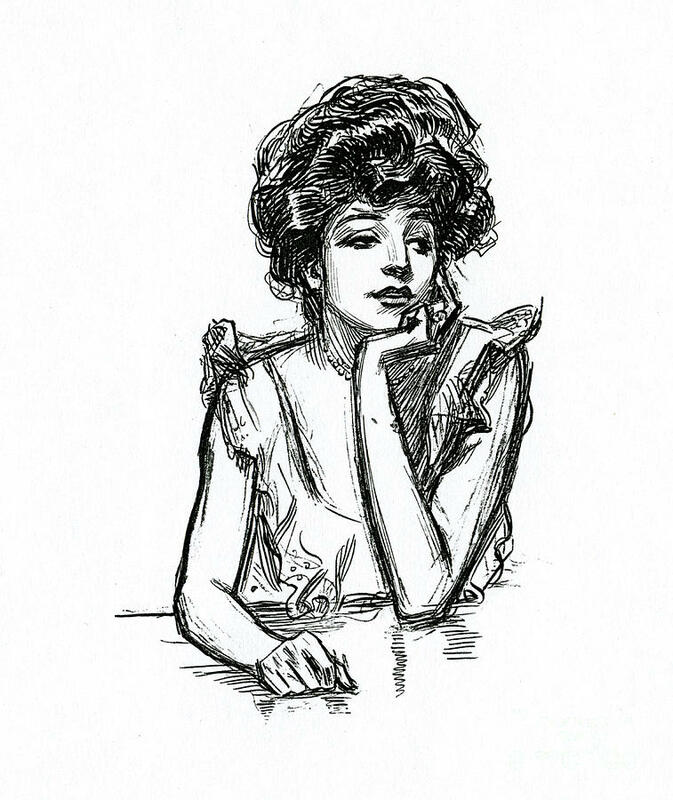 It was in the fall of 1907, when Albina "Bina" Bargala fell in love with John "Jack" Keyes, of Plymouth. She was Spanish and Chilean while Keyes was Irish and Canadian. It is never mentioned exactly where Albina lived in Amador County, except for census records that list her father being in Township #3. That township spanned a wide area which included the Clinton area, Pine Grove, Volcano, Shakeridge, and Pioneer area all the way up towards Kirkwood. It appeared that the couple were smitten for one another despite the fact she was only 15, and Keyes was 28. Albina ran away several times to be with Keyes, which upset her family. Maybe the couple thought their love story was exciting, almost like Romeo and Juliet sneaking off to see one another, but lovesick Keyes only found himself facing charges of kidnapping by Albina's father, Francisco. While still in jail on the kidnapping charges, Albina's father brought Albina to the county jail on January 16, 1908, and allowed his daughter to marry John Keyes. Charges were dismissed and the couple left the jail as man and wife, headed back to his home in Plymouth. It was not long until Albina realized that John and his family were not on the 'up and up' in the county. In fact, by September of that same year, she found herself pregnant and all alone when John and his brother, Edward were arrested for burglary and sent up to San Quentin on a 5 year stint. As luck would have it, while the two brothers were incarcerated together, they got off on good behavior and both were paroled early. John on September 1, 1910 and Edward in 1911. While John was in prison Albina had moved back in with her father and raised their first child, Johnny by herself. John had issues with a hot temper and it seemed that the couple fought quite often over the years according to the newspapers. By 1918, the couple had been married nearly eight years and on March 6 of that year they welcomed a new baby girl, Marie into their family. Albina told the staff at the hospital that she feared her husband terribly and that she was afraid to go home with him after the birth of their daughter, but she went anyway. This would prove to be a fatal mistake for both her and her daughter. One of the most brutal murders it has been our duty to record occurred yesterday sometime before noon at the Head place*, about two miles up the ridge from the Summit House, when Jack Keyes with the blunt side of an axe crushed the skull of his wife, Bina Keyes, aged 24, and then inflicted a fatal blow with the same instrument on the forehead of their 6 month old daughter, Marie Keyes. The first known of the crime was about 8:30 last night, when Keyes came to the County Hospital in Jackson and asked Superintendent Murphy for some poison. Murphy asked what he wanted it for, and Keyes replied that his had killed his wife and baby with an axe. Murphy told him it was hard to get poison but Mr. Dodd, the nurse, would take him down town for some, and while they walked away from the building Murphy quickly called up the Sheriff, who met Keyes shortly after this side of the hospital. Keyes told the Sheriff he had killed his wife and baby because a lady told him his wife was an anarchist. 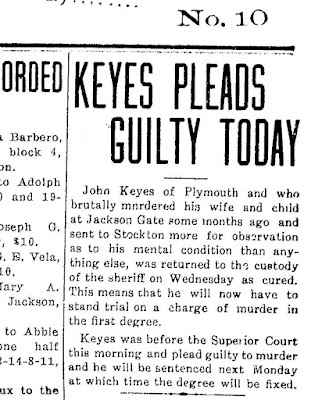 The Sheriff placed Keyes in jail and went to the scene of the murder. When asked why he killed the child, Keyes said he figured the baby was an anarchist also. He said he struck his wife several times with the axe before the fatal blow crushed her skull. After the murder Keyes washed the bodies, dressed and covered them. He sat around the house during the afternoon, until the time he came to Jackson. Keyes showed absolutely no signs of being intoxicated, as testified to by both Superintendent Murphy and Sheriff Lucot at the inquest held here today by Coroner Dolores A. Potter. During the inquest Keyes, angered at the removal of a stove poker from his reach, sprang from his chair and attacked Deputy Sheriff Ford. Instantly a dozen men were on the job and a well-directed blow on the murderer's neck by Telephone Manager Watts, a juryman, floored the belligerent. Soon after the murders, Keyes was sent down to the Stockton State Hospital for "observation" to check is mental state, at that time he was declared insane and ordered to remain there until his mind was able to comprehend the actions he made and face the consequences by the justice system. 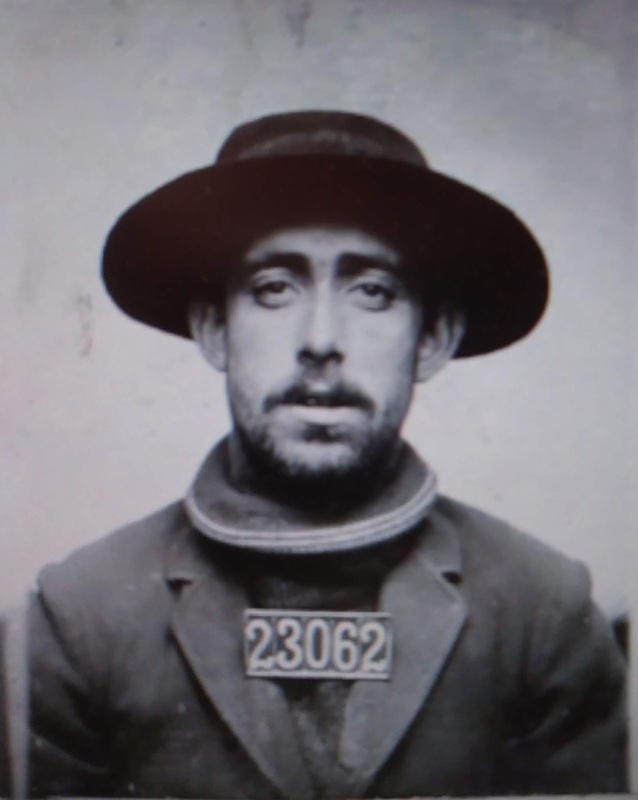 He remained there for over a year receiving treatment but by May of 1919, he managed to escape the hospital but was later apprehended. After further examination, the doctors at the State Hospital felt he was within the mental capacity to stand trial, and so they sent him back up the County Jail in Jackson to face the murder charges of killing his wife and baby girl the year prior. 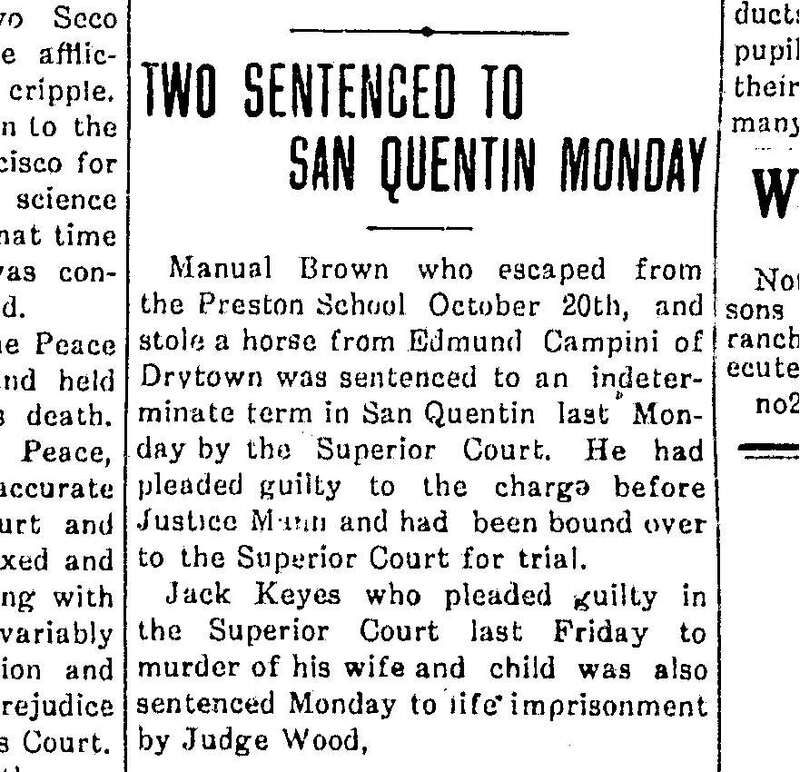 On November 13th he pleaded guilty and by the time the November 21, 1919 edition of the local paper came out, he had been convicted and sentenced to life in prison. 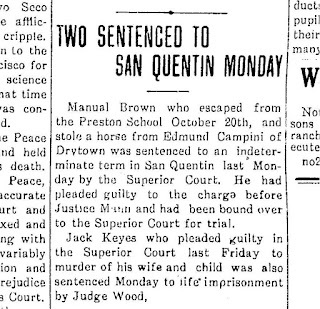 Keyes went to San Quentin State Prison on November 20, 1919 but he was only there for about a week before he was transferred to Folsom Prison on November 28, 1919. There he remained until 1920 when prison records show he was transferred to the Napa State Hospital to carry out the remainder of his life. The 1930 and 1940 census' show him as a patient or inmate there at the hospital in Napa. 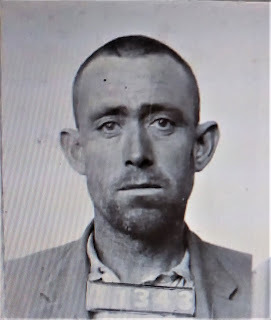 I could not locate any death record of his, so I have to assume he passed away while at the State Hospital and he is more than likely buried out in the field behind the hospital, among the many thousands of unmarked graves. 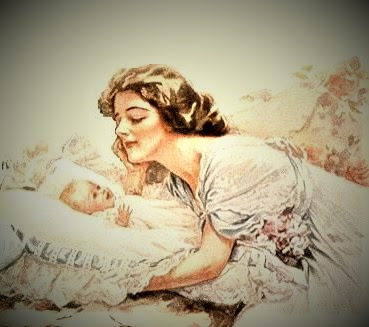 When going back to research this story I felt so sad for Albina and baby Marie. For one, Albina had been a young woman stuck in an abusive marriage during the early part of the 20th Century. Remember this was a time when leaving your husband was taboo.My heart is broken for baby Marie, knowing she didn't even live to see her first birthday. John Keyes was mentally sick to do what he did, and I wonder how he came to be that way in the first place. Some things we will never find answers to though. Besides the heartache for the loss of these two innocent lives, I also wanted to learn what became of their older son Johnny, but I found no information on what happened to him. More than likely his grandfather raised him, at least I hope so. If you head out to the Cemetery in Jackson it was nearly impossible to locate Albina's grave, but one contributor on Find-a-grave, Steve Jones managed to do it. I have since contacted him about finding the exact location, and I hope that soon I can have some sort of small marker with a stake for the ground designed in the future to mark the spot where Albina and baby Marie are buried. Everyone deserves to be remembered, and they have been forgotten for far too long. I will try to keep everyone updated if and when we get a marker put up for Albina and Marie! obtain permission to get some sort of memorial plaque for them both. Rest in Peace, Albina and Marie....you will never be forgotten again. Amador County Marriage Records, 1910. Note: The "Head Place" as noted in the newspaper is the Head Ranch which was located off of Ridge Road and was once owned by James Head. After his death, his wife Mary Ann Gardner inherited the ranch. Mary Ann was the mother of the infamous Emma Le Doux, who murdered her husband Albert McVicar in Stockton and stuffed his body in a trunk and left it at the train depot in 1906. According to records, Keyes was a laborer, so more than likely this family lived on the ranch of the Head family. "From first glance at the beautiful shore of Lake Camanche, located on the borders of Amador and in Calaveras Counties, you would never guess that at one time a town stood in its place. In fact, there were other settlements such as Lancha Plana, Poverty Bar, and Limerick, which was later renamed Camanche, before the man made reservoir was completed in 1963. Said to have been one of the biggest ranches in the area, the Hill Ranch spanned between 500 to 1,000 acres, and was run by a woman by the name of Euphemia Hill. 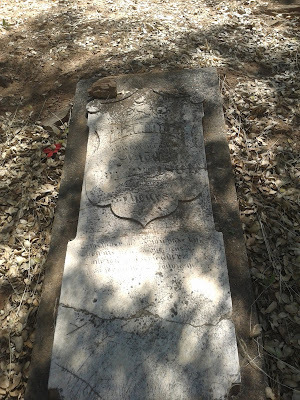 Widowed at the age of 31, Euphemia picked up where her husband left off and carried on managing the ranch, all the while raising three minor children on her own. The story of how she became a widow is an interesting and complicated one to say the least. Apparently Euphemia was not happy with her marriage to Lawson so she filed for a divorce on May 12, 1861, the very same day he died. Although it was said to have been a neighbor who took Euphemia to the courthouse to petition for divorce, Lawson was adamant that it was Tate who influenced her to leave. In a drunken stupor, an armed Lawson Hill confronted Tate and a shootout ensued. After the dust cleared, Lawson was dead and Marion Tate was the last man standing. The Society for the Preservation of West Calaveras History’s website index sources note that Marion Tate was acquitted of the murder of Lawson Hill on May 13, 1861, so it appears that his actions were accepted as self-defense. Unfortunately, one Hill family descendant would disagree with the story entirely. According to an article from the Stockton Record, kindly provided to me by Danielle Ballard at the Calaveras Historical Society, there’s been some misconceptions about Hill’s death down through the years. Pleasant Hill III, the great nephew of Euphemia and Lawson Hill, was interviewed for the newspaper many years ago claiming that Lawson was murdered by Tate and that the inquest showed that Tate approached Lawson when the incident occurred. He was adamant that the newspapers had made Lawson look like the bad guy, when really he was the victim in the story. Pleasant Hill also mentioned that Lawson’s murder occurred right when he was just starting a hog ranch on his property. He was only 35 years old and still in the prime of life. Lawson is buried at the small and forgotten Pioneer Cemetery on the south side of Highway 12, about two miles east of San Andreas. His headstone battered and broken by time and the elements, now lays flat up against the hill and centered in a newer concrete foundation, no doubt to keep the stone from sliding down. 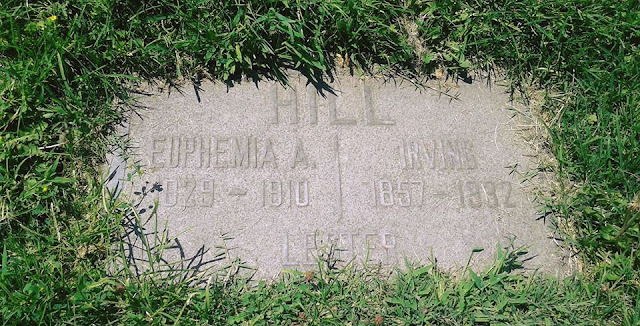 In 1910, Euphemia Hill passed away at the age of 81 years. She was laid to rest on the Hill Ranch in a private cemetery. Her last remaining son, Irving died in 1932, and he also was buried beside his mother in the family cemetery. 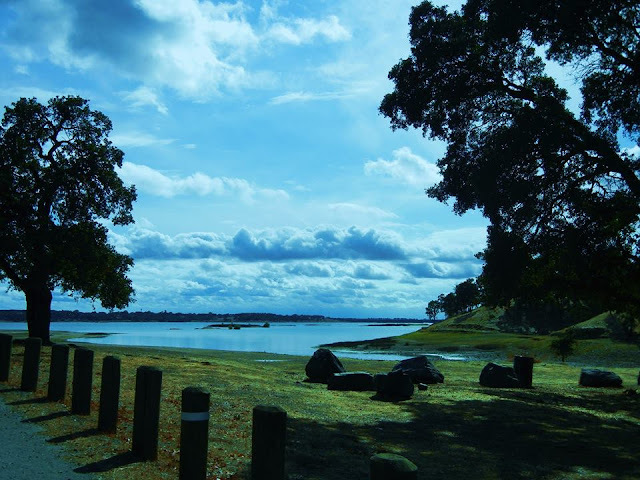 By the early 1960s, when Camanche was deserted and plans to fill the area in with water to create a reservoir had started, the Hill family was exhumed from their original burial spots and reinterred at the historic Lodi Memorial Cemetery in Lodi, California. What once was the Hill Ranch now lies at the bottom of Lake Camanche, forgotten and buried in a watery grave. An interesting point I would like to share is that there is also a newer, separate marker at the Lodi Memorial Cemetery for Lawson Hill with his same birth year and death year, right next to Euphemia’s marker. I spoke with Isabel at the Lodi Memorial Cemetery who pulled the old archived records and the mystery deepened. Their notes state date of death as being January 1, 1861, and burial on October 25, 1861, which we know to be incorrect dates. She said there was no official record of him being buried at the cemetery. It would have been impossible for Lawson to have been buried in that section at the Lodi Cemetery at the time of his death. The section where these plots are located is not part of the old historic section, so there would not have been anyone buried there at that time in 1861. Even the marker itself is newer, and had to have been added around the same time Euphemia and her sons were reinterred there in the 1960s, as the cemetery staff stated. Lawson Hill’s original grave, where I believe he is still buried, still rests on the steep hill at the Pioneer Cemetery off Highway 12. He is literally a man with two graves. In the recent years, the Calaveras Enterprise mentioned that the old television series, “The Big Valley,” which first aired in 1965, starring actress Barbara Stanwyck, was based on Euphemia and the Hill Ranch at Camanche. The article forwarded to me from Danielle Ballard at the Calaveras Historical Society also mentions this story reiterated by Pleasant Hill during his interview for the Stockton Record years before. To read more stories like this one, purchase your copy of "Stories of the Forgotten" on Amazon today! U.S. Census Records, 1860, 1870; Find-a-grave; Society for the Preservation of West Calaveras History, website index, #1736, P, Lawson Hill Inquest, May 13, 1861, Acquittal of Marion Tate, (Calaverashistory.org); Pacific Rural Press, July 23, 1892; Lodi Memorial Cemetery, Burial Records; California Death Index, 1905-1939; California Wills and Probate Records, 1850-1953; “Euphemia A. Hill, Rancher of Calaveras County, CA.”- Women of the Old West blog; “The Forgotten Cemetery– Pioneer Cemetery Established 1851”- Charity Maness, Calaveras Enterprise, February 10, 2015; “Memories Alive at Lode Cemetery”- Kathy Geiszler, The Stockton Record (archived news clipping), courtesy of Danielle Ballard, Calaveras Historical Society. Who was Vesta Belle Sapenter? What Happened to Dorothy Waldrop? Corinne Elliott Lawton - What Really Happened to Her? William Holden's Death - Accident or Murder? All the content that is published on this site under my profile is my property and is protected by all applicable Copyright Laws. 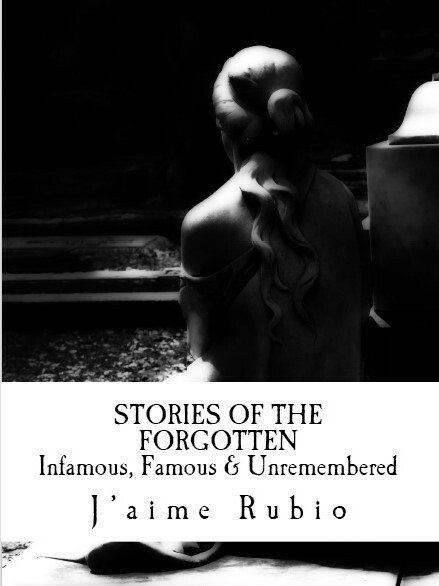 No part of my work may be reproduced, stored in a retrieval system, or transmitted in any form or by any means without prior written permission from me, the publisher/author J'aime Rubio.